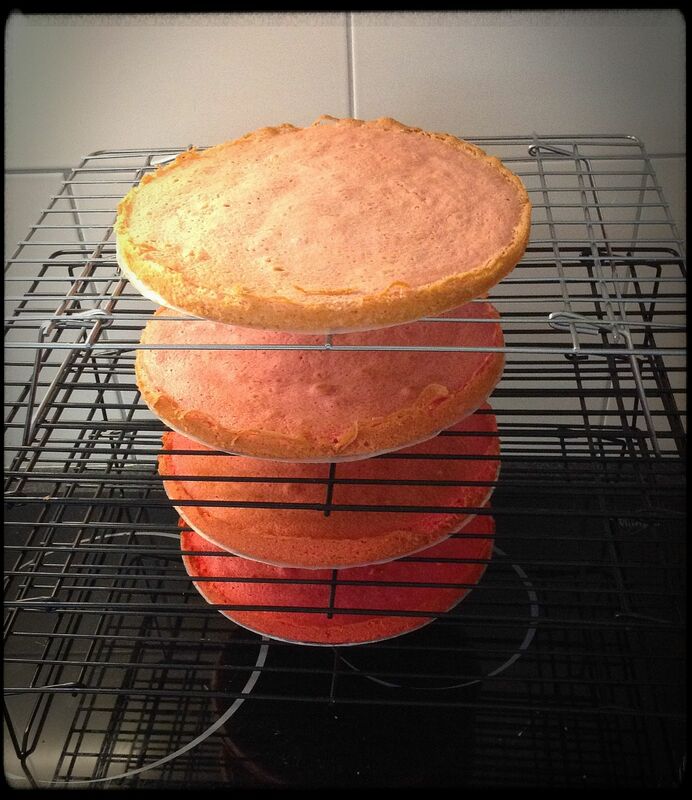 I loved making the pink rainbow cake back in January but I must admit that it was quite high on admin, what with whisking egg whites and folding them in after the colouring process, and I also found the texture to have a slightly more ‘chewy’ quality than I would have liked, so I set about devising a new recipe. 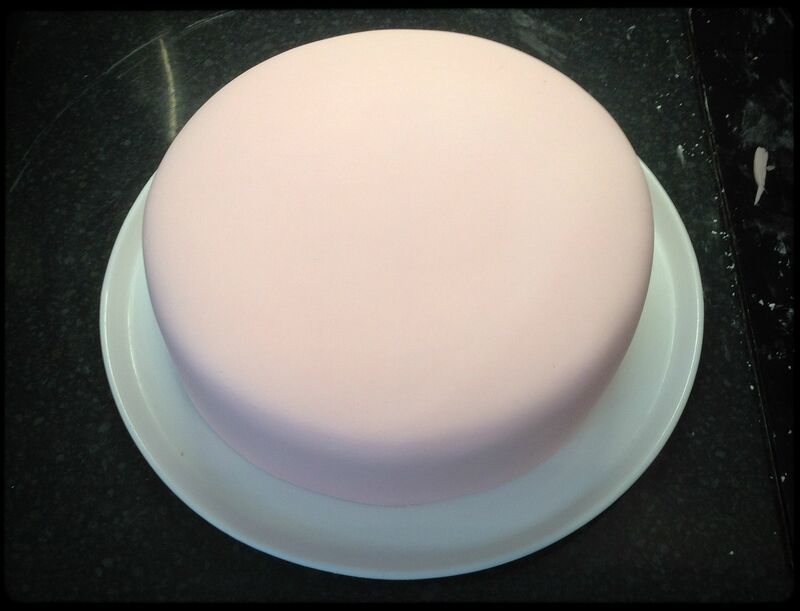 I’m delighted to announce that my cakes-perimenting (forgive me) proved worthwhile and this new recipe boasts a delicious flavour, light sponge texture and is white enough to offer a decent pink. Base-line two (or more, if you have them) 20cm loose-bottomed sandwich tins. Weigh your empty mixing bowl and take note of the figure. Preheat your oven to 180C. Briefly beat the butter, then add the sugar and beat for a few minutes until pale and fluffy. Sift the flour and baking powder into a separate bowl. In a third bowl, use a fork to blend the egg whites and vanilla extract together. Add a couple of spoonfuls of the egg mixture to the butter mixture and beat, then add a couple of spoonfuls of the flour and beat; continue alternating until everything is in, then add the yoghurt and mix briefly again. Weigh your full mixing bowl and subtract the weight of the empty bowl so that you know how much mixture you have. Allowing at least a 10g margin for the mixture that will be irretrievable from the bowl, divide your figure into four and weigh the mixture into four small bowls. Colour each bowl individually, being careful to not to leave any lumps of gel colour unmixed. Bake in batches, two tins at a time, for approximately 12 minutes per batch. I’d advise baking the darker sponges first to see how much the tops brown; you might decide to cover the paler sponges loosely with foil at the 8 minute mark. If you do this, they might need a couple more minutes in the oven. When sponges are this shallow, a skewer isn’t necessarily the most sure-fire way to tell if they’re baked. I rely instead on a gentle prod with the pad of my finger – if it leaves a dent and you hear a crackle of bubbles beneath it, the sponge needs a couple more minutes. You can see from the texture whether it’s properly baked or not. Remove from the oven, carefully run a knife around the edge and remove the sponges from the tins, sliding them onto a wire rack. 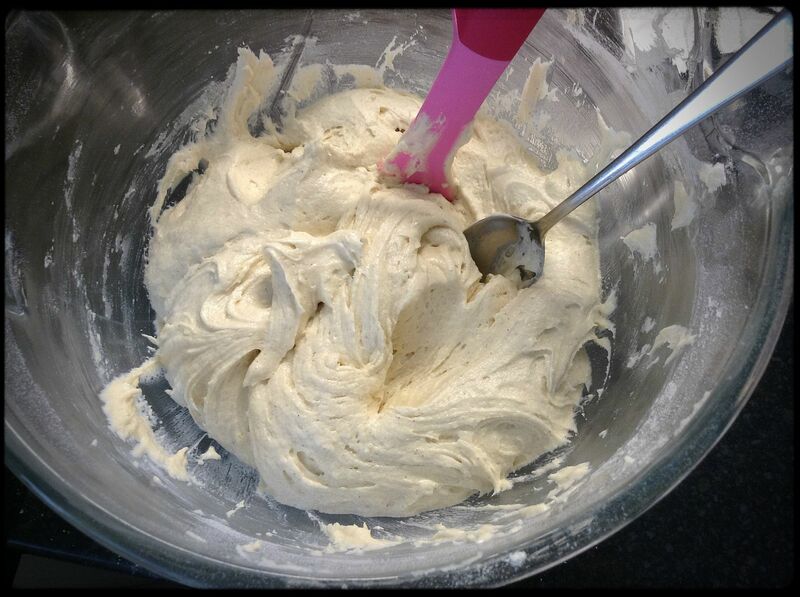 Method: beat the butter on medium-high for a couple of minutes – it’ll look almost whipped when it’s ready. Add the icing sugar, and (unless you’d like a fine film of icing sugar to cover every surface in your kitchen) either cover the bowl with a tea-towel before putting the mixer on, or combine it slowly with a rubber spatula before blasting it in the mixer. Beat it on medium-high speed for a minute or two, then add the milk one tablespoon at a time. Ambient influences might mean that you need more or less milk than I did so it’s best to add it gradually and see how it feels. The longer you beat the buttercream, the fluffier it will become. I beat mine for up to 10 minutes. For this cake, I had been asked to fill between each layer with buttercream and jam, so spread a mean layer of buttercream, then used a high quality seedless raspberry jam on top. Against the vibrant pink of the sponges, the jam takes on a brownish hue, but it doesn’t show when the cake is cut so there’s no need to add colouring. If you’re using jam, be aware that it makes your stack of sponges significantly more mobile so keep an eye on the vertical line to avoid getting a Leaning Tower of Cake. I learned something about this recently. I learned that it is 100% worth the effort of clearing space in your freezer to accommodate a cake mid-icing. 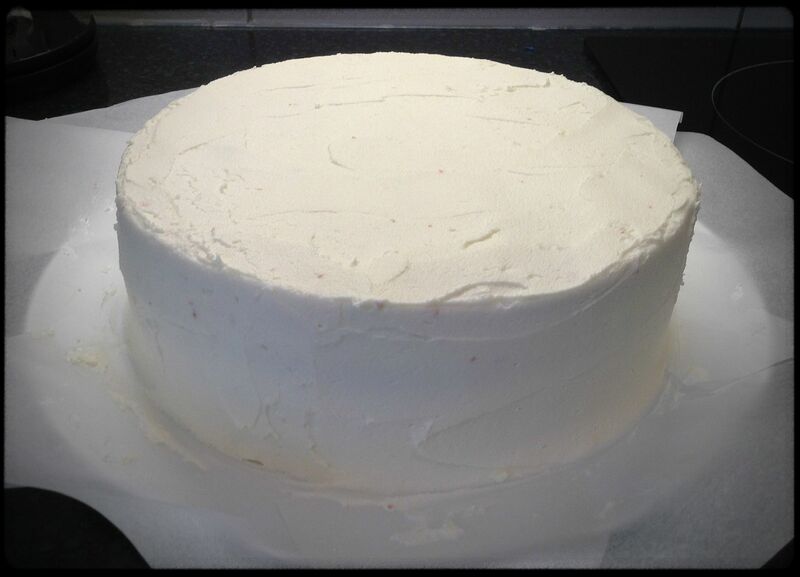 I did a very thin crumb coat, then put the whole cake in the freezer for no more than 5 minutes – just enough time for the butter to become more solid and adhere properly to the sponge. Then I hoiked it out and applied the second layer, which was then significantly smoother. 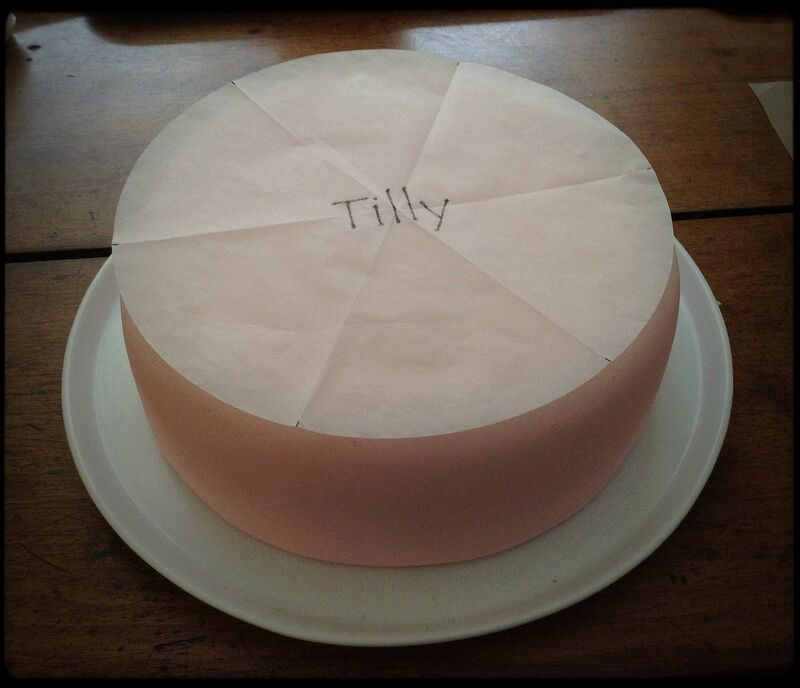 Next, I measured the cake diameter and walls to determine how big my fondant needed to be. 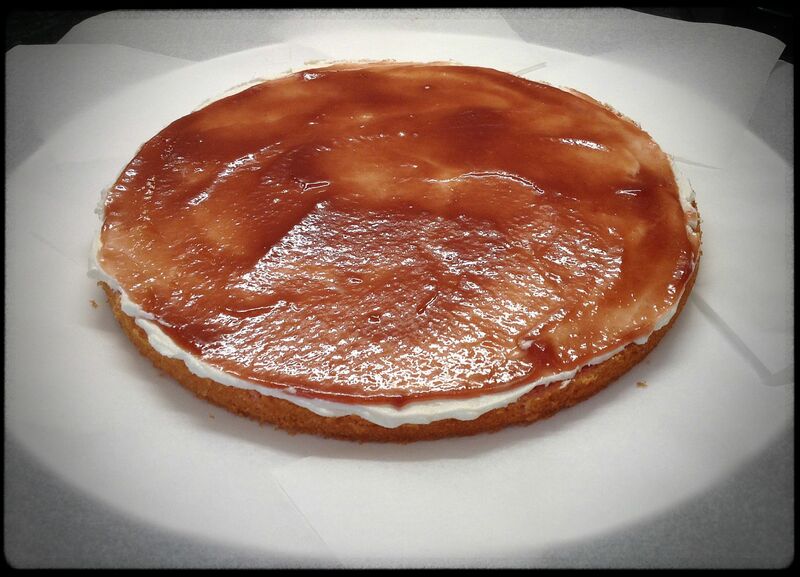 I set the timer for 10 minutes (which is the maximum time the cake could be in the freezer again) and put my smoothly buttercreamed cake back in the freezer whilst I cleared the decks of my miniscule kitchen and prepared everything I needed for the fondant. I had to colour my white fondant pale pink, so I used Trex to grease the inside of the KitchenAid bowl, then threw in 1kg of fondant in hand-torn chunks, together with about a teaspoon of Trex and a tiny bit of Claret gel colouring. I set the dough hook running on the slowest speed and stayed nearby in case it had a tantrum. 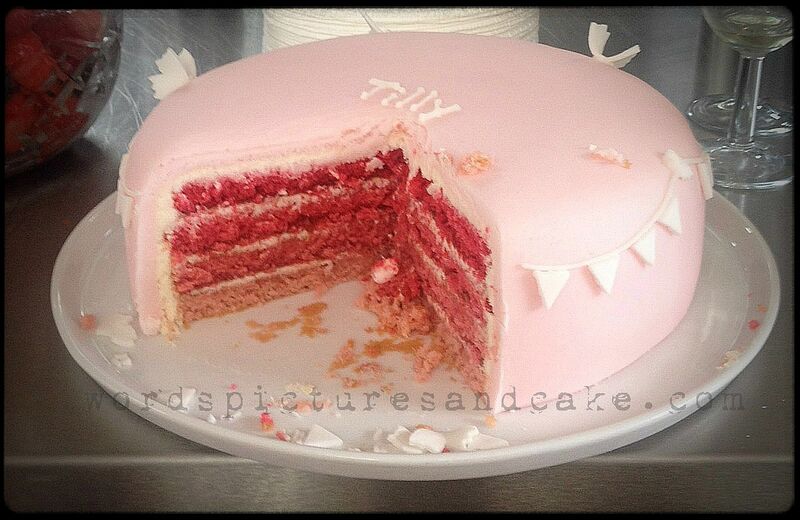 It coloured the fondant beautifully and I avoided getting any annoying fibres from my clothes embedded into it. Win. I switched off my halogen hob at the mains (I learned that lesson the hard way), dusted its surface with cornflour (possibly a little too much, because I’m PARANOID about the bloody stuff sticking) and laid my non-stick rolling pin out ready. 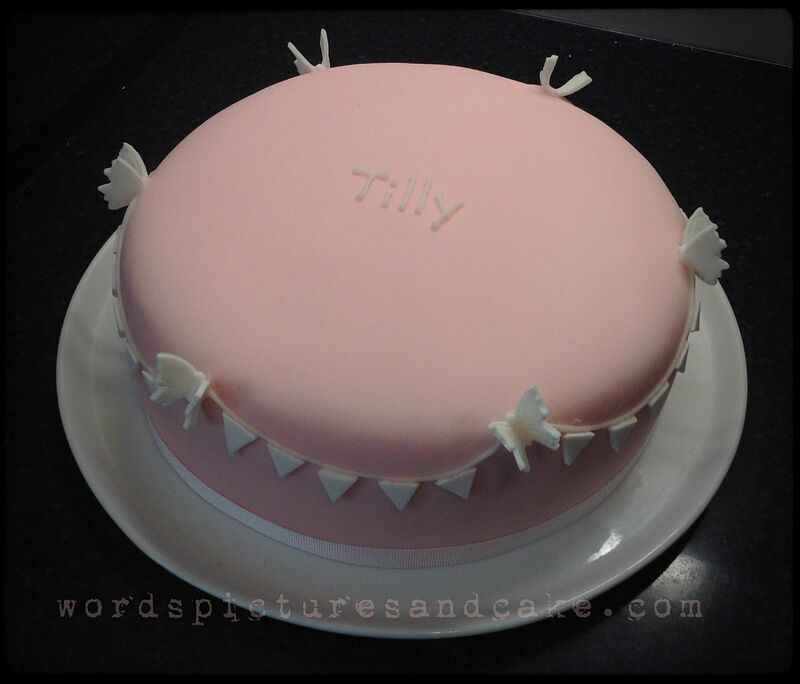 I very carefully kneaded the fondant and shaped it into a round, then flattened it a bit with the palms of my hands – moving it around the surface all the time – before rolling it to the right size. The timer buzzed, so I got the cake out of the freezer, steadied my shaking hands, rolled the fondant onto the rolling pin and draped it gently but quickly over the cake before dumping the rolling pin and setting to work smoothing the fondant to the cake. 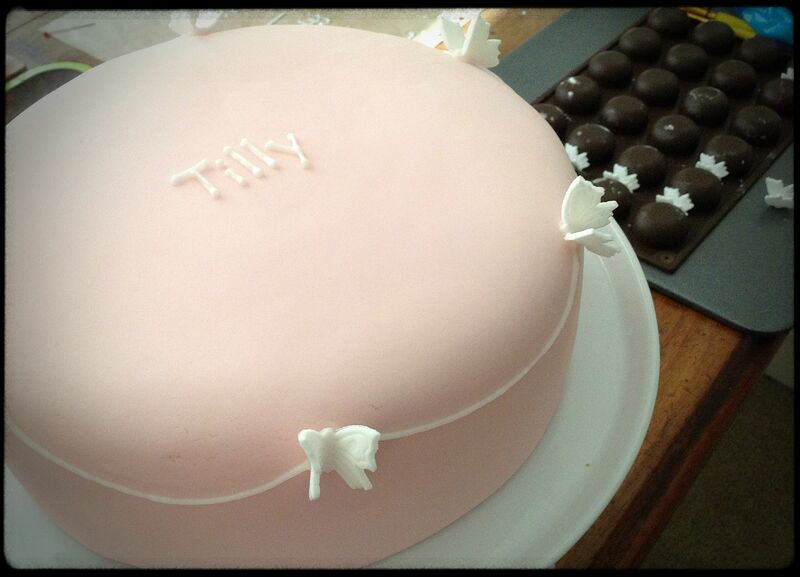 It seems the warmth of my hands was enough to soften the buttercream so that the fondant adhered to it. A quick once-over with the smoothing paddles, a trim round the base, a bit of tucking in and I was tickled pink (pun intended). The decoration for this cake looks beautifully simple but has its challenges. 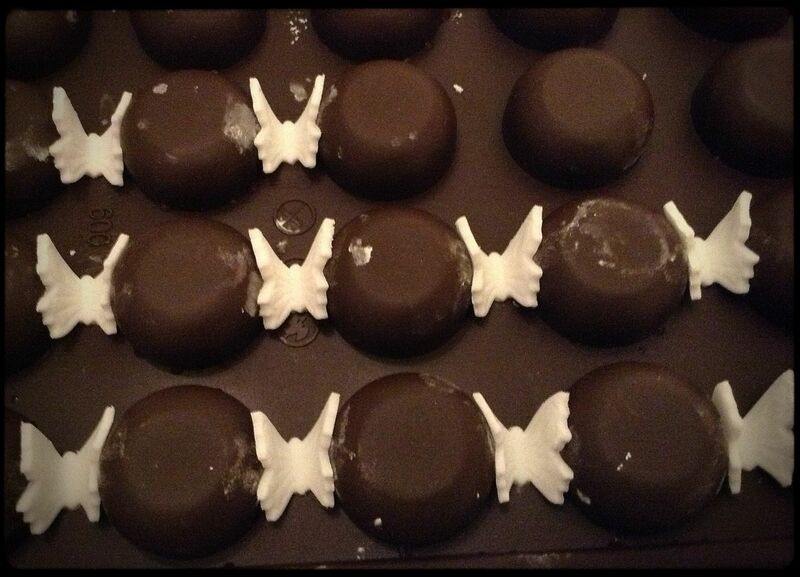 The first thing I did (a couple of days in advance) was roll out some white fondant, cut and emboss some pretty butterflies with a plunge cutter, then sit them in between the humps of a chocolate mould to dry with their wings up. Whisk the egg whites until frothy. Add the sugar a spoonful at a time and fold in with a rubber spatula. Add the lemon juice and glycerine and stir. I then give mine a blast with the KitchenAid to get rid of any lumps and make it nice and smooth. Having tried a couple of other methods (one of which being the ill-fated “freehand”) to get piped icing decorations right, I have discovered that my ability to get things central is a reliably out of whack so this time, I CHEATED. That’s right, folks. I’m a cheat. And I recommend you cheat, too. 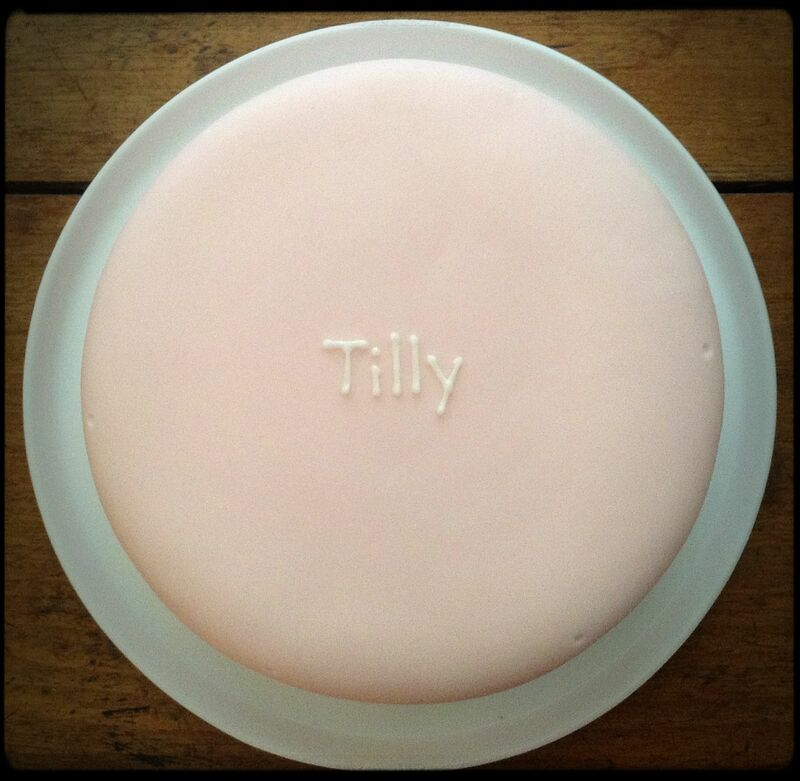 I printed Tilly’s name off in a font I liked, then I took one of the 8” greaseproof circles I use to baseline my tins, folded it into six equally spaced sections and traced Tilly’s name with a pen smack bang in the middle, and marked each crease clearly at the edge. I laid the greaseproof circle centrally on the cake and used the blunt tail of a pen to create a faint indent on the top of the cake. I was then able to pipe over this accurately. I used a 1.5 nozzle and went over the letters twice to make the name stand up nicely; I prefer this to using a larger nozzle. Next came the lines for bunting, for which I used a 2 nozzle (if you fit your piping bag with a coupler you can easily switch between nozzles). I found this really tricky and can’t honestly claim to be happy with my result but I am told that I’m my own worst critic so I didn’t lose too much sleep over it. I popped six of my butterflies on the joins between each swag of bunting and let them set in place. For previous bunting-adorned cakes, I have painstakingly measured my flags by hovering a ruler over the fondant so as not to make dents with it and using a knife to cut each flag. BUT I don’t have to do this anymore because I have an OCD Chef Chopping Board which is, frankly, the best thing ever. Once my flags were done, all I needed was a steady hand and tiny blobs of royal icing to attach the flags to the cake and a white grosgrain ribbon round the base. Beautiful in its simplicity, I hope you’ll agree.